The cover of the July 1958 Sir! magazine depicts Jim Bowie's fabled knife duel with a Mexican in which their left hands were tied together and their pant legs nailed to a log. The blades look disappointingly small, Bowie looks like an actor in a 1950s TV western, and the Mexican has a bandolier of metallic cartridges that would not be invented for another 40 years, but what the painting lacks in accuracy it makes up for in dramatic action. The interior story is reprinted below, in its entirety. It describes several of the legendary fights of Bowie. The accounts include numerous factual errors and exaggerate the details to a degree unmatched by anything published previously. They called him The Young Lion. He was tall, with blond hair and broad shoulders that hunched when he walked. The great American Southwest saw many giants, but none to compare with the incredible legend of Jim Bowie. Slave runner, land baron, soldier, fortune hunter--Jim Bowie was all of these. But the pages of history accord him special recognition for his feats with the terrible weapon that was named after him--the sharp, glinting, murderous Bowie knife. According to eyewitnesses, Jim became a cold-blooded, cat-like man when the angry blade was in his hand. It was short and broad, with a razor-sharp edge, and weighed over a pound. One quick slice was enough to spill a man's guts out in a gray-green pool on the ground. It was in 1831 that Jim Bowie first used this weapon. He returned to his boyhood home of Washington, Arkansas, and went directly to the blacksmith shop of Joseph Black, a thin, quiet man with a reputation for leading well-developed young ladies out behind the shop to show them the moon through the branches of a great hickory tree. In a letter to his brother Harlon, Joseph Black recalled: "Jim, he come in the shop and took up a piece of brown paper with a shape drawn out on it. 'Joe,' he says, 'I want you to make me a knife out of this here pattern. Make it good and make it sharp and don't spare the fire.' So I took it and figgered that as long as I was making him a knife, I might just do it up brown and besides, I been wanting to make one myself for some time, you remember. "I fired up two pieces of the best metal I could get and hammered out two knives. I tempered them just right. I never before used that temper, but you know that since then I have been the only one around who could make a real Bowie knife and I ain't figgering on telling nobody how, not even you (ha ha, I am just joking, you know that, Harlon). "Jim, he come back to Washington in about the middle of June and I had it all finished, and I showed him his knife. He let on like he was real happy and said how much did he owe, and then I just couldn't hold it in no more and I bust out laughing and showed him the one I had made too and first thing you know, he slapped me on the shoulder and called me an old so and so (you know that I or no-one I know has ever heard that man use a cuss word?) and said that he would take the one I had made and that he was mighty obliged to me. "Then he said something real funny. He took out the pistol he had stuck in his britches and took a pot shot at that big old hickory tree, and then he said: 'The good thing about this here knife is that it don't take no time to reload it.' And he threw it just as pretty as you ever did see and stuck it all the way through the bark. I tell you, Harlon, that was one real mean fighting knife I made him and that boy sure knew how to use it." Jim Bowie had good reason to know how to use a knife. From the time he was 15 he was in and out of scrapes. He was not what you might call a good man, but he was honest in that he would never cheat or lie or steal from you. A card sharp named Bloody Sturdivant learned this the hard way one day in Natchez-under-the-Hill just a few weeks after Jim picked up his knife from Joseph Black. Jim was having a quiet drink when he saw a young man named John Lattimore gambling with the packet-boat gambler who had a reputation for fast dealing. Lattimore was losing and suddenly Jim got up and went over. "Lattimore," he said, "you've never laid eyes on me but I know your father well. As an old friend, let me take your place for a while." Within half an hour Jim had won back all the money the boy had lost, and a few hundred to boot. He got up from the table and handed Lattimore the money. "There it is," he said. "Next time stay out of card games with sharpers who deal from the bottom of the deck." Bloody Sturdivant flushed angrily and leaped up. "You can't talk like that about me!" he yelled. "Apologize or give me satisfaction!" "My pleasure," Jim said, narrowing his eyes. "Knives it is. You made a mistake this time, you pretty boy planter." "My name is Bowie," Jim said quietly. "And if your knife is as fast as your tongue I'll worry." Sturdivant went white. If he had been alone with Bowie he might have tried to find some way out of the duel. But a crowd was watching with interest. So the burly gambler put on a sneer and laughed. "Talk about fast tongues!" he growled. "It'd take a strong rope tied around your foot to keep you from running all the way to New Orleans the minute you get your first cut." "Why, then," said Jim, "we'd better do something about that. What say we have it out in the morning, with our arms tied to each other with rawhide?" Then he turned and walked through the silent crowd. Behind him Sturdivant sank into his chair and gulped a drink. The next morning the two men met in a small circle traced out in the sand beneath the bluffs of the Natchez waterfront. Their left wrists were lashed together with a strand of buckskin. At the signal Jim jerked his opponent to him and slashed out with the heavy blade. A jagged tear appeared in Sturdivant's sleeve, and as the gambler shrieked in agony Jim kneed him in the groin. Sturdivant's knife sparkled in the early morning sun as it flew to the bank of the Mississippi and rolled into the brown water. The gambler cowered and prepared himself for the death thrust but Jim Bowie merely laughed coldly and slashed the buckskin that bound them together. "Call this quits, Sturdivant," he said. "But be careful in the future who you cheat." Almost gibbering in gratitude the gambler staggered up the hill. He was through in this town, but at least he was alive. Others were not so lucky. Once a neighboring Spanish planter challenged Jim over a girl named Lucy Harding. The two men met in the early morning chill and once again Jim fought with his left wrist lashed to his opponent's. "For you, always!" replied the planter. The signal came and with it the Spaniard spat full in Jim Bowie's face. Jim drew his head back, surprised. Then, as the planter raised his arm to thrust with his narrow razor-sharp dagger, Jim countered with a solid thrust of the Bowie knife that ripped through the Spaniard's jacket and lace-trimmed shirt. The planter stiffened and blood gushed from his mouth and nose. He stood, transfixed, as Jim's blade searched his bowels. 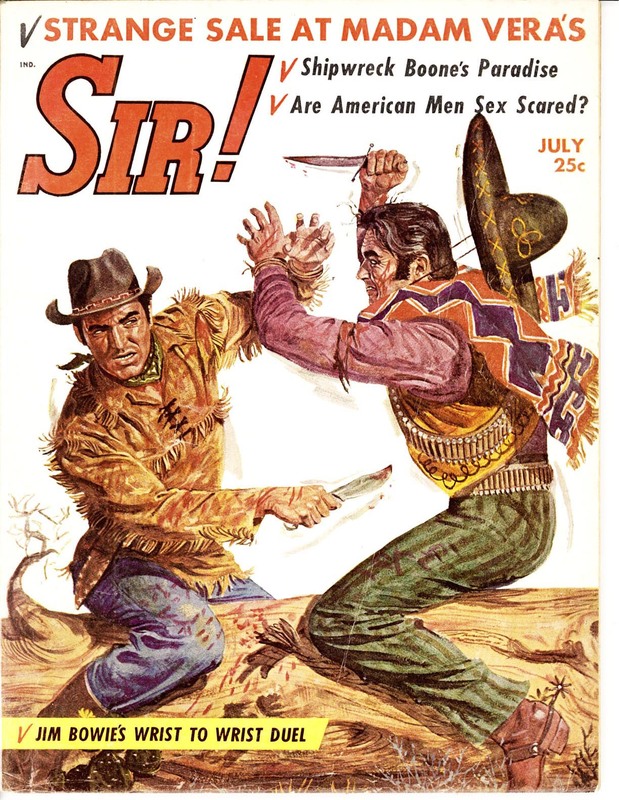 Coolly Jim slid his blood-smeared knife from the planter's belly and sliced the buckskin thong that bound them. The Spaniard fell backward, his legs straining once as a ragged gasp ripped from his bloody lips. No one knows for sure how many men Jim Bowie faced with the heavy knife that came to be so widely copied throughout the Southwest. Later, after his heroic death at the Alamo in 1836, the Bowie family tried to hush up Jim's many battles. But to his contemporaries he was rightly a man to be feared. He didn't look for trouble, but when it came to him he met it with cold steel. Before leaving Natchez he was involved in a bloody duel in which, oddly enough, the principals were completely unharmed, while the seconds slaughtered each other. Dr. T. H. Maddox and Col. Samuel Wells, a prominent Rapids Parish planter, met on the field of honor. They fired simultaneously and both missed. Both agreed that their disagreement had been settled and they prepared to retire for a much-needed drink. Jim and his friend Richard Cuney were seconds for Dr. Maddox. Col. Robert A. Crain and Major Norris Wright, who had no great love for Jim, were standing up for Col. Wells. Cuney and Col. Crain began arguing over the fiasco of the duel. Crain claimed nothing had been settled and the two men should fire again. "You're just a blood-thirsty professional killer!" Cuney shouted, and suddenly gunfire erupted. No one could be sure who had drawn first but within seconds Crain's slug had caught Cuney full in the chest and Jim had fired at Crain, missing. Cuney was slammed back against a tree, gasping for breath as he went down. Before Dr. Maddox could reach him he was dead. Now both Crain and Jim drew second pistols and fired. Jim missed again but Crain's ball struck Bowie in the thigh, ripping out a painful gash. Jim staggered and went down on one knee. As he fell he drew his knife and leaped toward Crain, who hurled his pistol at Bowie. Jim fell again, his forehead torn by the heavy weapon. At that moment, without warning, Major Wright leaped past Crain, drawing his own sword. "You've been looking for this!" he yelled as he thrust the wicked blade at the prostrate man. Jim caught the blade in his left hand and turned it into the ground. With an inarticulate grunt he pulled Wright down onto him and the wide razor-sharp blade of the Bowie knife sliced into the major's abdomen, opening it to the backbone. Wright stiffened as he felt the deadly thrust. "Damn you, Bowie," he groaned, "you've killed me." Without another sound he collapsed and died, his blood and guts spilling over Jim's jacket and trousers. But the bloodiest battle in history was yet to come. It was related to a Memphis newspaper by Judge William F. Pope of Arkansas. "Jim Bowie was a difficult man to anger," said the judge. "I have seen him smile at insults that would send other men reaching for their pistols. But once angered I have never seen a man so determined to take the fullest vengeance from his enemy." The judge then went on to describe one of the goriest knife fights he--or anyone--had ever seen. It seems Jim had been drinking in an Amarillo saloon when a Mexican strode in and, slapping his hand on the bar, demanded service. The bartender refused, claiming the man was already drunk. Jim Bowie intervened. "Serve him," he said. "He's no more drunk than I am." The Mexican turned on him and swore in Spanish. Jim just smiled tightly and sipped his drink. Finally the man came right up to him and, breathing alcoholic-tainted breath into his face, said: "Gringo with water for blood, your white face disturbs me. Go before I make you eat dung!" Jim rose and slapped the man across the face with a beer-soaked rag. "When I eat offal," he said tightly, "you had better hide." This was no duel between gentlemen. This was a brutal, violent battle between beasts. Without another word Jim and the Mexican went out into the field behind the saloon and took off their jackets. Each was insulting the other in the vilest and most descriptive terms possible. No simple fight was enough to satisfy these two. The onlookers, most of them natives of Amarillo, were horrified when Jim asked for a hammer and nails. They had all heard of the bronze giant's strange manner of fighting with wrists bound together, but the spectacle they were about to witness seemed beyond belief. Watching each other keenly Jim and the Mexican-sat down astride a log and had their left wrists bound together. Then, as the onlookers gasped, Bowie ordered the surprised bartender take the hammer and, piercing the leather britches both men wore, nail them to the log! "Shall we make it quick?" Jim asked, struggling to keep control. "Quick as a whole summer day!" hissed the other man. "You will swallow your own cojones today!" Jim set his jaw and settled back on the log, digging his feet into the parched earth. The signal came. Both men tensed but neither moved. The crowd watched, breathless. The fighters studied each other tensely, the only movement being the flare and constriction of air-sucking nostrils. Suddenly the Mexican struck. His blade whispered through the air and drew a red line along Jim Bowie's jaw. Jim struck back as the man twisted and the Bowie knife searched only empty air. "Gringo!" hissed the man. "You are slow! " Jim Bowie licked at the blood that ran into the corner of his mouth. The gash was slight but bled profusely. Then Bowie slashed out. This time he didn't miss. The heavy blade crunched into the Mexican's jaw with a bone-tearing noise that made the watchers wince. The face that had been smooth and brown was suddenly a grotesque, torn mask, with the white roots of teeth exposed through the quivering wound. Blood frothing from his lips, the Mexican lunged at Bowie. His knife pierced Jim's side but struck no bone, and the impetus of his thrust carried him forward until he was bent almost double, the belt of his trousers digging into his belly as the nails ripped out of the seat of the leather pants. "Not so quick," Jim said quietly. He slashed at the man's arm and as the tendons separated and ripped back from the wound the Mexican dropped the knife and shrieked in agony. Jim lifted the great Bowie knife and touched it to the Mexican's throat. The man shuddered and his tongue lolled from his mouth. Smiling coldly, Jim reached down and picked up the other knife. He put it on the log between them and placing his own beside it, raised his hands into the air. The Mexican made a quick grab. Catching up his knife he thrust it toward Jim, who parried the thrust with one hand, while lifting his own weapon with the other. "Pardon," he whispered as the cruel weapon plunged into the Mexican's solar plexus. The man strained and once again his knife fell to the ground. An evil glint in his eye, Jim released his grip on the Bowie knife. It protruded from the man's belly, plunging up and down as the Mexican gasped from pain. "Once more?" Jim asked softly, pressing the knife into his opponent's hand. The Mexican had guts. He tried again and this time his blade sliced a hole in Jim's thigh. Jim had no need to thrust again. He merely caught the handle of the Bowie knife and twisted it in a full circle. The Mexican's mouth was a grotesque cavern, filled with blood and exposed teeth. He wailed once more, then fell forward against Jim, vomiting blood and guts. Jim had to be carried from the log to his hotel, where he lay in bed for almost a week. The Bowie knife lay with him, but to the best of anyone's knowledge that day in Amarillo was the last time it ever tasted blood. The next February Jim Bowie was at the gallant, futile battle of the Alamo in San Antonio. He lay ill with pneumonia as Santa Anna's soldiers battered at the walls of the undermanned fortification. The Mexicans breeched the wall, gained the chapel and moved on into the barracks. Jim Bowie saw the face of a grenadier and, taking up a pistol, fired. The face sank out of sight but was replaced by another. Raising his other pistol, Jim fired again. Then the room was full of soldiers and as he made a grab for the faithful Bowie knife, he saw the flash of a descending bayonet, felt a brief moment of pain. The Mexican officer in charge ordered that the fallen Mexicans be buried with honors while the Texans were thrown onto a huge fire and burned. As the down-heartened people of San Antonio started to obey the order General Santa Anna moved along the scene of blood and carnage. At last he went into the barracks and saw the torn body of Jim Bowie and the two fallen Mexicans. "He was much too brave to be burned like a dog," Santa Anna said. "See that he is given decent burial." The sky was bright and clear and full of sun. The Mexican general looked down again and shrugged. "But, then," he said softly, "what does it matter? Throw him on the fire." Granted, this article is shameless balderdash throughout, but I have to take particular exception to the statement, "Jim Bowie was at the gallant, futile battle of the Alamo in San Antonio." How was it futile? The inspirational last stand was key to the success of the Texas Revolution. 'Shameless balderdash" indeed. Bowie was more known for his slave trading and real estate profiteering (not that there was anything wrong with that in the day) than for crazy knife fighting. As far as I know the only documented knife fight he was ever in was the Natchez sandbar fight and as noted, he was not involved as a principal but as a friend of one of the principals. "That's Not a Knife--THIS is a Knife!"